Myntra Does #MobileWapasi, Relaunch Their Mobile Website! First reported by Medianama, it has been revealed that Myntra’s mobile website has been re-launched with some catalogs being offered for mobile customers. As we can see here, some products like sarees and shirts are now available on Myntra’s mobile website, which were not available before. Earlier, the only option available on Myntra’s mobile website was a banner/link to Google Playstore for downloading their app. The current mobile website still prompts the users to download the app for completing the purchase, however, we believe that it’s only a start and very soon fully fledged mobile browser would be operational. After Flipkart acquired Myntra last year, they completely redesigned their customer acquisition policy, and decided to first ditch their mobile website in the month of March this year, and then decided to shut down their desktop website in May. Both of these decisions were highly criticized by hard-core Myntra fans, but nothing convinced them to move back. After Flipkart also decided to make a move to app-only mode by closing down their mobile website, there was a virtual revolt among e-shoppers, and we received huge number of comments (or rather complaints) against this move. Amazon, Jabong and Snapdeal flatly refused to copy this app-only trend which threatened to negatively disrupt the ecommerce movement in India. Myntra even tried to lure customers into their application by offering eye-candies and special offers; but their sales continued to go downhill; thereby prompting them to do a reality check. The results we have clearly seen now. Within 8 months of their app-only move by closing down their mobile website, Myntra has now made a 360 degree turn towards mobile browser based access. Business Rule #1: Listen to Your Customers! As we had repeatedly shared earlier, and as hundreds of Myntra’s customers had complained: no company can sustain their branding and operations unless they ‘listen’ to their customers. Myntra’s app only approach was a disaster, a completely illogical step harnessed solely to get more app downloads. In a way, they converted a marketing campaign to increase app downloads into a full-fledged business model; and they had to pay the price. Yes, they can ping (push notifications) their customers more with apps, they can track their location and then bombard them with offers and sales news every hour. But how can their users have that shopping experience which can come from a browser based shopping portal? How can their users compare prices, and checkout the product in greater detail? We are still adamant that desktop version is equally important as that of a mobile browser or an app. After all, even Amazon, Alibaba or eBay (considered to be the biggest ecommerce portals of this globe) couldn’t dare to ditch their desktop versions. And we are sure that Myntra have to come back to desktop version as well; considering that it provides a richer experience of online shopping. We will keep following the updates as it happen. 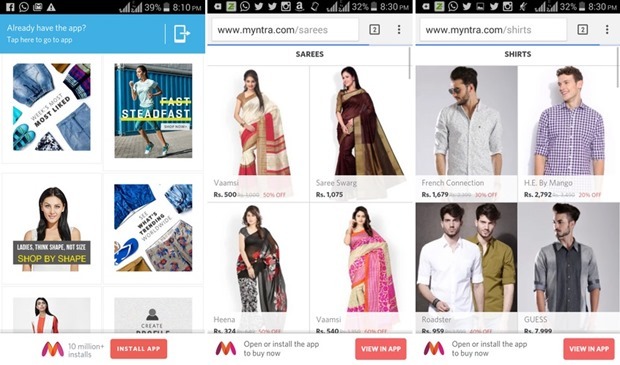 "Myntra Does #MobileWapasi, Relaunch Their Mobile Website; Admission of App-Only Blunder? ", 5 out of 5 based on 5 ratings. I am also agree with you because day by day people are uninstalling mobile app one of the reason is space.